Smoke is, by definition, a collection of airborne liquid and solid particles and gases that are emitted when something burns. It also contains a certain amount of air. You may recall from science class that burning is a chemical change – that is, when you burn something, you alter its chemical composition. Many of the by-products of combustion are harmful to inhale. Vapour, by contrast, is a substance in its gas phase. It isn’t hot like smoke, and it hasn’t undergone a chemical change. It could still be condensed back into a liquid by adding pressure. When you vaporize a liquid, you alter its state but not its chemical composition. Vaporized e-liquid does not carry the same health risks as smoke. Vaporizing an e-liquid produces vapour while lighting a cigarette produces smoke. Although they share visual similarities, the two have almost nothing else in common. They are composed of different materials, and they behave differently in the air. 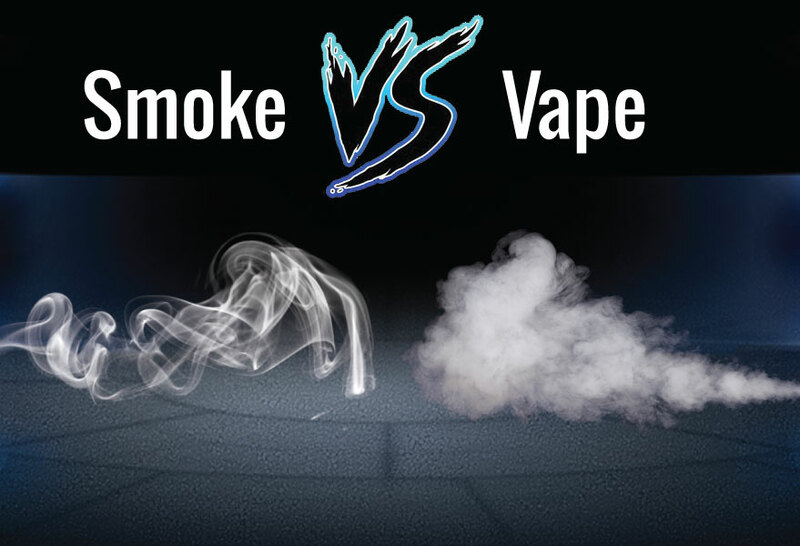 Here is a closer look at the individual differences that set smoke and vapour apart. Smell. The smell of cigarette smoke can linger in the room for a very long time – days, weeks, or longer. If you smoke inside long-term, you may never be able to get rid of the smell entirely. Smokers become so used to the odour that they don’t notice it as much as non-smokers. On the other hand, vapour clouds – even though they may remain visible in the air longer than smoke – have a smell that is both much more pleasant and dissipates much quicker. Composition. The only thing that e-liquid and tobacco have in common is nicotine. Tobacco smoke contains thousands of unhealthy chemicals; dozens of them are known to cause cancer. Vaporized e-liquid isn’t water vapour, but it’s not too far off, containing only a handful of ingredients including nicotine, vegetable glycerin, propylene glycol, and food-grade flavours. Except for nicotine, these ingredients are all safe to ingest. Inhalation has been proven neither safe nor unsafe; research continues. However, it’s clear that it’s much less harmful than smoking cigarettes. Temperature. Cigarette smoke is extremely hot. Although it does cool rapidly when inhaled and exhaled, it is still potentially hot enough to damage the mucous membranes inside the mouth and throat. E-liquid is vaporized at much lower temperatures, and the resulting vapour is cool – exhale on your arm to see. Residue. Have you ever seen the stained walls and furniture of a long-time smoker? The tar in cigarette smoke doesn’t just kill; it also stains everything in its path. Carbon monoxide and other by-products of combustion will help create that yellow tint on your walls. This problem is nonexistent with vapes. If you weren’t sure about the difference between smoke and vapour or you needed easy answers for curious bystanders, hopefully, this clears it up.